Thank you for joining us for the FLASCO Business of Oncology Summit, Friday, April 12. The mission of increased dialogue between the physician, patient, payer, pharmacist, and pharmaceutical representative was accomplished! Topics of current interest were addressed within the 7 sessions. Thank you, Fred Moore, for leaving us dumbfounded and entertained Friday night! The FLASCO Spring Sessions were challenging and appreciated. Another great success brought to you by the FLASCO Program Planning Committee! We appreciate the FLASCO membership for their active participation – attending and interacting with our speakers and exhibitors. Biography: Adrianne Mallen, MD is a gynecologic oncology fellow at Moffitt Cancer Center/University of South Florida program where she specializes in surgical and chemotherapeutic management of women with gynecologic malignancie s. Prior to moving to Florida, she completed an obstetrics and gynecologic residency at University of Iowa Hospitals and Clinics and medical school at University of North Dakota School of Medicine and Health Sciences. Dr. Mallen is passionate about cancer research, particularly involving disparities, healthcare outcomes and clinical trials. In the first year of fellowship, most of her time was spent dedicated to research. She was located at Moffitt Cancer Center working on a number of projects, most involving ovarian cancer. Growing up in a rural, Midwest state with minimal access to cancer subspecialty care has made her particularly interested in geographic disparities and healthcare access barriers and how to increase access to patients for clinical trials. Biography: Dr. Christine K. Fitzsimmons is a current first year gynecology oncology fellow at Advent Health-Orlando in Orlando, Florida. She graduated from the University of New England College of Osteopathic Medicine in Biddeford, ME. During her medical school training she was a member of Sigma Sigma Phi National Osteopathic Medicine Honors Fraternity and served as the school’s Student Government Association President. She was a representative for the Maine Osteopathic Association and served as national secretary for the Council of Osteopathic Student Government Presidents. Dr. Fitzsimmons received her training in Obstetrics & Gynecology at Wellspan/York Hospital in York, PA. During her chief year, she served as education chief resident where she was named “Best Resident Educator”. She was also recognized by the American Association of Gynecologic Laparoscopists for “Excellence in Minimally Invasive Surgery” and by the Society of Gynecologic Oncologists for “Outstanding Resident in Gynecology/Oncology.” Dr. Fitzsimmons has board eligibility from the American Board of Obstetrics & Gynecology. Dr. Fitzsimmons has a background in clinical research at Brown University/Women and Infants’ Hospital of Rhode Island and as a research assistant at the University of Vermont. Her current research projects focus on treatment modalities and outcomes for early stage cervical cancer. Dr. Fitzsimmons has an interest in quality of life projects and improvement with postoperative care. In these research areas, she has presented and published a few abstracts and peer reviewed articles. Dr. Fitzsimmons is a New England girl at heart and will frequently be seen sporting a New England Patriots scrub hat in the OR. Although, she is excited to spend some time away from the cold and snowy winters and enjoy some of the Florida sunshine. Biography: Shohreh Eliaszadeh, MD is an anatomical/clinical (AP/CP) pathology board eligible pathologist and has completed a one year hematopathology fellowship at the University of Michigan. Currently, she is an oncologic surgical pathology fellow at the Moffitt Cancer Center. Dr. Eliaszadeh completed her AP/CP residency at the University of Illinois at Chicago, where she was fortunate enough to conduct research projects and case reports. Upon graduation from fellowship, she preferred to work in an academic setting, where she can practice both surgical pathology and hematopathology with a collegial group of pathologists and clinicians. She looks forward to working in the state of Florida and contributing to the medical community. Biography: Reima is currently an Oncologic Surgical Pathology fellow at Moffitt Cancer Center & Research Institutes. She completed her Anatomical and Clinical Pathology Residency and Cytopathology fellowship at University of Texas in San Antonio prior to moving to Tampa, FL. Her passion for the cancer research began early before starting residency when she worked as a research assistant in the molecular neuro-oncology lab at Henry Ford Hospital in Detroit, MI discovering new targetable pathways of Glioblastoma Multiforme. In the last few years, she has presented research at four national meetings which provide a forum to discuss new ideas and innovations in surgical pathology and cytopathology. Biography: Bilal Farooqi, MD is currently a third year fellow in hematology-oncology at the University of Florida in Gainesville. He completed his residency in internal medicine from Mercer University in Macon, Georgia and was excited to move back to Florida to complete his fellowship. He is enjoying his time in Gainesville (go Gators!) but he is also looking forward to graduating from fellowship in June! Bilal grew up in Tampa, FL and is hoping to be involved in the Florida community as a hematologist-oncologist after the completion of his training. Biography: Dr. Sonikpreet Aulakh is completing her 3 years of hematology-oncology fellowship in June 2019 from the Mayo Clinic, Florida. After finishing her medical school in India, she graduated as an internal medicine physician from the Wayne State University, Michigan in 2016. She is pursuing physician-scientist career in the field of neuro-oncology. Her national/international presence is palpable with her publications and presentations. Her clinical and laboratory work is focused on both primary and secondary brain tumors. Biography: Junaid Arshad, MD completed his medical school in 2010 from King Edward Medical University, Lahore Pakistan. He came to United States in February, 2013 and became a research volunteer for the Wayne State University, Michigan. He then completed his residency in June 2017 from St. Mary’s Hospital, Waterbury, CT, a community program affiliated with Yale School of Medicine. After completion of residency , he joined the fellowship program at University of Miami/Jackson Memorial Hospital which is in progress. Dr. Arshad is currently a second year Hematology Oncology Fellow graduating in June 2020. He has selected a clinical research track for his fellowship. Dr. Arshad’s research interests include the use of ctDNA and selection of targeted therapies in soft tissue sarcomas especially GIST. Biography: Sofia Palacio is the chief Hematology/Oncology fellow at the University of Miami, Sylvester Comprehensive Cancer Center. She received her medical degree from CES University in Medellin, Colombia and continued her internal medicine training at University of Miami where she was Chief Resident. She is interested in Breast and Gastrointestinal cancers and her clinical research is focused on Global Oncology and reducing disparities in cancer care. Since starting fellowship she has authored a number of peer publications and has had poster presentations at national and international meeting including ASCO GI, World Lung and San Antonio Breast Symposium. Biography: Analia Perdomo received her Bachelors of Science in Biology at the Florida International University. During her time at FIU, she was a Teaching Assistant for the General Chemistry Labs and a chemistry tutor through the Assistance for Academic Achievement Tutorial Program offered to students. In 2015, Ms. Perdomo accepted a position as a research assistant at the University of Miami Hospital’s Orthopedic department where she assisted in clinical studies relating to treatment and outcomes of traumatic orthopedic injuries. Currently, Ms. Perdomo works as a pharmacy intern at PillPack Pharmacy where she aids pharmacists in prescription transfers, packaging medications as well as checking for drug interactions. At NSU, Ms. Perdomo has served in the Student Government Association executive board for two years as Secretary and Vice-President where she’s coordinated events for the College of Pharmacy in an effort to facilitate professional development. Through SGA she’s been able to give back to the community by organizing fundraisers for both the Puerto Rico Relief and Breast Cancer raising over $1,500 collectively. Her leadership involvement earned her a position into Phi Lambda Sigma Pharmacy Leadership Society, a prestigious and competitive national society where she currently serves as Secretary of her chapter. Over the years, Ms. Perdomo has developed an interest in pediatric oncology and her passion grew upon shadowing a pediatric pharmacist at Holtz Children’s Hospital this past year. Upon graduation, Ms. Perdomo wishes to pursue a PGY1 and PGY2 specialty in Pediatric Oncology. Biography: Jennifer Tejeda is a third-year student at the Nova Southeastern College of Pharmacy. She has been a pharmacist intern at Innovative Telepharmacy Solutions for over a year, and she has recently joined the in-patient pharmacy at Palmetto General Hospital. These two jobs have strengthened her work experience in both outpatient and inpatient health care. She has had an interest in the field of oncology since the beginning of her career, and although she keeps an open mind towards other areas of expertise, she has been focused on expanding her knowledge in the realm of oncology. She volunteers on an ongoing study in a particular area of research at the NSU AutoNation Breast and Solid Tumor Cancer Institute, where she assists in data collection. At NSU, she is currently the Administrator of Public Affairs in the Student Government Association, and she organized a fundraiser event raising over $600 to donate to this institute. Some organizations Jennifer is involved with are Rho Chi Academic Society, APhA, SSHP-FSHP, and she is honored to now be a FLASCO member. 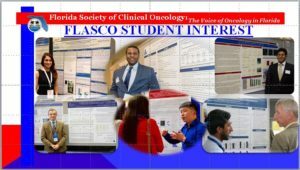 Biography: Vivian Cuesta; is a second-year pharmacy student at the University of Florida College of Pharmacy, Orlando campus. Born and raised in Florida, she has a son named Daniel who is her motivation to pursue a professional degree in Pharmacy at this time. Vivian wanted to be an inspiration to her son as well as provide financially stable future for the both of them. Vivian has always wanted to work in healthcare because of her passion and desire to care for others just as she cared for her grandparents and now parents. Unfortunately, she often fainted at the sight of blood and thought healthcare was not meant for her. Then, she became a certified pharmacy technician and worked for 4 years with Walgreens where her pharmacy manager encouraged her to continue studies and become a pharmacist. With the desire to be an inspiration to her son and encouragement to further studies by my pharmacy manager, she worked and studied hard, applied and got admitted to the PharmD program at the University of Florida. When she started pharmacy school, she was very interested in cancer research and treatment because both of her grandparents were diagnosed with cancer. Vivian was too young at the time to understand the disease or how she could help after their diagnoses, until they both passed. Since she started at the UF College of Pharmacy, she realized the many roles she can play as pharmacist on oncology care teams with management of the many medications that these patients have to use. Vivian learned about optimizing doses for pain management, and management of side effects of pharmacotherapy that are seen in oncology patients. However, she continues to be curious about many other things that the pharmacist can do as well as what is expected of the pharmacist by other professionals on the team, especially the oncologist. Vivian look forward to learning about some of these at the summit as well as opportunity for networking and development of interprofessional collaboration and communication skills that she hopes will someday be helpful to her in providing superior care to oncology patients in the state of Florida. During the Spring Session, FLASCO will acknowledge all Awarded Travel Awards for the first half of the year. Come back to this page to see the photos from the conference!